Many liquids, including water, have been used as lubricants to minimize the friction, heat, and wear between mechanical parts in contact with each other. Today, lubricating oil, or lube oil, is the most commonly used lubricant because of its wide range of possible applications. For the optimum use of the lubricants, it is necessary to reach the appropriate density of them when producing. In the same way, maintain it lubricants stored in tanks. The density is a key property not only in lubricants but in all fluids. It is the measure of the mass of a substance in relation to a known volume. This property is crucial for some of the attributes of lubricants. For example, as the density increases, the fluid becomes thicker. This raises the time it takes for a particle to settle. Various industries use lubricants for different needs. 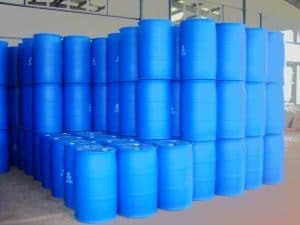 Companies tend to maintain lubricants stored in tanks in large stored. Over time, these lubricants begin to settle out as well as lose their density, which is crucial for the utility of the lubricants. It could turn an economical problem if companies have to discard industrial quantities of lubricants. 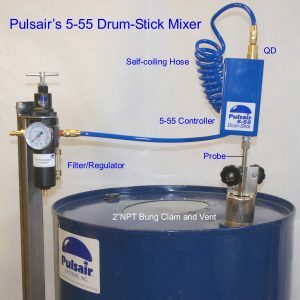 For that reason Pulsair, mixing tank systems, have developed the ultimate lubricant blending system, the 5-55 drum mixer stick. It is a lightweight mixer that is incorporated into a 55 gallon drum or any other size tank, which mixes the lubricants from the same tank without having to transfer the mixture to another tank mixer. In this way companies does not need to discard lubricants that have settled out. Because the Pulsair mixer stick leaves the lubricants as newly produced. and liquids with high percentage of solids.